Adventure #278 (Nov 1960) - Aqualad Goes to School! 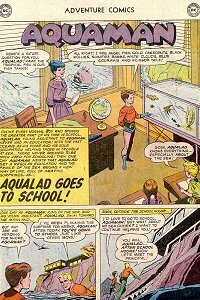 Aquaman decides Aqualad must attend school, but first he has to pass an entrance exam. Captured/Knocked Out report: Aqualad is hit by a capsized boat and his memory is affected. Quotefile: Aquaman, "How is Aqualad doing?" Miss Pine, "Wonderfully, Aquaman! My review today secretly included Aqualad's test questions and he answered them all perfectly! He's sure to score 100% on his entrance exam tomorrow!" Finny Friends Report: Aqualad dives into a target made by luminous fish. Whales lift an armored ship to remind Aqualad of the Merrimac. Sea-horses surface to remind Aqualad of the Trojan Horse. Swordfish and hammerhead sharks punch a piece of driftwood into the shape of Italy. Two octopi swim by to remind Aqualad of the number of keys on a piano. Whales blow water into the classroom to remind Aqualad of Chief Rain-in-the-Face. Sawfish and octopi free a figurehead from a sunken ship, and eels frame it to remind Aqualad of the Mona Lisa. Flying fish soar in the air in a coded pattern to remind Aqualad of Morse. Eels form a compass to give Aqualad the origin of the word "news". And the assorted fish all wink back at Aquaman in the final panel of the tale. Miss Pine asks for an animal famed in greek mythology, and Aqualad answers with the Trojan Horse, which wasn't an actual animal. And gets it right. Other questions are as odd. Here's the complete list of questions we see asked: "What vessel was sunk in a civil war battle between two iron-clad warships? "; "Name an animal famed in Greek Mythology! "; "Name a great country on the Mediterranean! "; "How many keys in a piano? "; "Name a famous American Indian Chief! "; "What famous portrait hangs in the Louvre museum in Paris? "; "Who invented the telegraph? "; "What's the origin of the word 'news'?" I don't really think that "news" is an acronym for "North, East, West, South", that sounds like an explanation somebody added later. Aqualad needs water every hour, and so turns his requirement into shows for the other students. We have to presume that from this moment on, Aqualad attends school regularly and Aquaman has him assist after school hours and during breaks. This makes sense, as he later shows up in Scotland going to college. Of all the sidekicks, Aqualad is one who is actually shown to get schooling in something other than beating someone up.